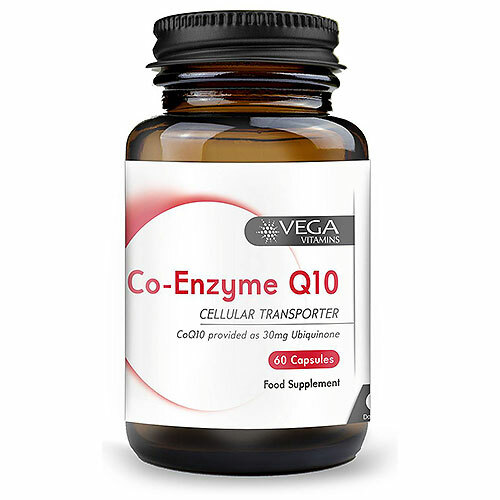 Vega Vitamins Co-Enzyme Q10 is a cellular antioxidant of natural substance called Ubiquinones, found in the brain cells, heart, kidneys, liver, pancreas and muscle tissues. Co-Q10 plays an important role in the mitochondria of cells and supports their energy producing pathways, generating cellular energy to help fuel the body`s daily activity. It is also an electron/proton carrier which may help the mitochondria to produce adenosine triphosphate (ATP). Co-Enzyme`s may support the immune system and potent fat-soluble antioxidants which help protect the fatty tissues of the body against harmful free radicals. Vega Base (Acacia Gum, Fruit Juice Concentrates (Aronia, Apple, Elderberry, Blueberry & Blackcurrant)), Vegetarian Capsule Shell (Hydroxypropyl Methylcellulose, Colours (Titanium Dioxide, Copper Chlorophyllin)), Co-Enzyme Q10, Anti-Caking Agents (Silicon Dioxide, Magnesium Stearate). As a food supplement for adults, take 1-2 capsules daily with food or ad directed by a healthcare practitioner. 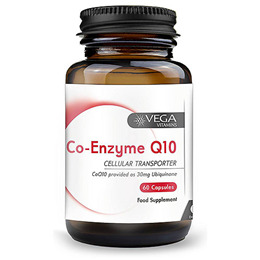 Below are reviews of Vega Vitamins Co-Enzyme Q10 - 60 x 30mg Capsules by bodykind customers. If you have tried this product we'd love to hear what you think so please leave a review.